Whether you are a commercial client or homeowner in Northern California, Wing Solar & Wood Energy, Inc. offers a variety of options designed to provide alternative energy sources that have real results while also saving the environment. Below you will learn briefly about those options. We encourage you to continue your tour of our site. If you have questions or we can assist you in any way, please feel free to contact us toll free at 1-800-492-4061. For your convenience, you may also request more information from this site. If you are considering investing in a wind turbine in Northern California there are a few factors that should come to mind. We would like to invite you to continue your tour of our website. 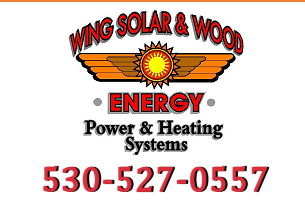 If you are in Northern California and have further questions or would like to schedule a consultation with our client care specialist, please contact Wing Solar & Wood Energy, Inc. toll-free at 1-800-492-4061. For your convenience, you may also request more information from this site.